This week, Your News to Know brings you the top news stories about gold and the overall economy. Stories include: Whom is gold voting for, Robert McEwen sees prices as high as $1,900 by year’s end, and secret Alpine gold vaults are the new Swiss bank accounts. Whom is gold voting for in the upcoming election? The Presidential election isn’t until November 8, but the markets are already feeling its effects – more specifically, the effects of the uncertainty that surrounds it. Should Donald Trump assume office, much of his plans still remain a mystery, yet one thing seems certain – he intends to change a few things. Analysts aren’t sure that a Trump win would be good for gold despite the assumption that the metal thrives in uncertain times. The Republican candidate expressed his dislike for low-rate policies, meaning that his victory could lead to a more hawkish Fed, a stronger dollar and weaker gold prices. This has also led some analysts to believe that a Clinton win would be good for gold. CNBC’s Alex Rosenberg, however, presents several compelling reasons why gold could thrive with Trump as POTUS. Some predict that a surprise Trump victory could cause market anxiety and, in turn, bolster the prices of gold. Since stocks dislike uncertainty, a Trump win could create issues in the stock market. The uncertainty in question, and the market volatility it would usher, could cripple bond yields even further as the Fed is unlikely to raise rates in such an environment. Lastly, the greenback itself might lose value; currency trader Kathy Lien of BK Asset Management has observed that foreign investors are “extremely nervous” about Trump winning and market participants are already selling off dollars in preparation for this. Since gold generally has an inverse relationship with stocks, bonds and the dollar, any one of these assets taking a dive would be good for the metal – and all three sinking could send gold prices soaring. 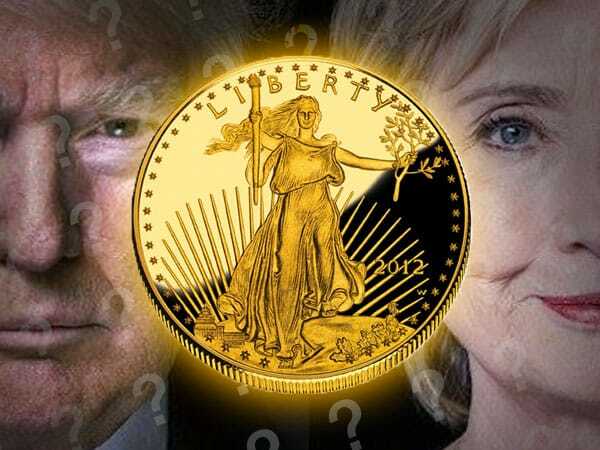 When one adds to this the possibility of Janet Yellen resigning from her position as Federal Reserve Chair should Trump take the helm, it seems that a victory for the Republican candidate could also mean a victory for gold. Robert McEwen is known as one of the gold industry’s most fervent bulls. Aside from multiple bold predictions over the years, the former investment banker’s actions have reflected his views: he founded two gold producers, McEwen Mining Inc. and Goldcorp Inc., and has been betting big on them ever since. His most recent prediction is par for the course: McEwen sees gold trading in a range of $1,700 to $1,900 an ounce by the end of the year due to uncertainty surrounding the stability of global currencies and sovereign debt. He feels record-low global interest rates will cause “a huge amount of anxiety” and might make prices surge by as much as 44% by year’s end. McEwen’s long-term forecast for the metal is as bold as ever: with the way things have been going, he thinks gold could reach $4,000 within the next four years. Switzerland has gained quite a reputation over the years as a place where people can store wealth away from prying eyes without much scrutiny. Yet the famous Swiss bank accounts are no longer what they used to be, with the government now enforcing strict rules that allows inquiries by the account holder’s native country. A recent Bloomberg report highlights an alternative on the rise that makes use of Switzerland’s lax rules involving gold bullion. John Cassara, former U.S. Treasury special agent and author of books on money laundering, says, “the gold trade is a huge part of the Swiss economy” and the government doesn’t want to crack down on it. This shows in the country’s bullion imports: in the first half of this year, 1,357 tons of gold worth $40 billion were imported to Switzerland, putting the year on course for a new record. The report features two company owners that offer similar services – discreet storage of large amounts of bullion in former military bunkers – although one of them is considerably more secretive. The first owner, who claims to run the largest store of gold for private clients, asked that both his name and company be omitted due to fear of theft. Those who choose to store gold in his airstrip-adjacent vaults in the Swiss Alps can rest assured knowing that their wealth is protected by an armored guard and a 3.5 ton metal gate that requires a code, a facial-recognition scan and an iris check to open. For maximum convenience, the vault owner also provides luxurious lodging nearby for clients who wish to avoid leaving a record of their visit. Since both companies are independent from the banking system and essentially unregulated by any governing body, their appeal is at an all-time high considering the state of the global economy.